Irish Rail at Glounthaune—Two Views. 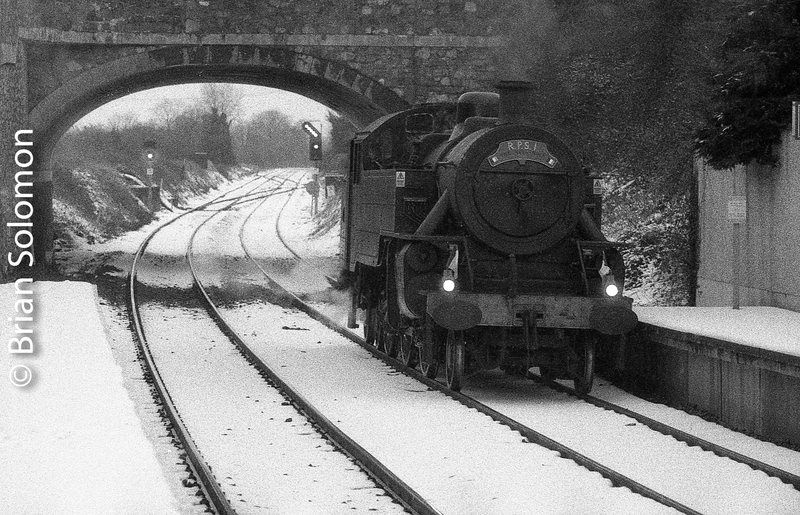 Earlier this month I made a visit to Cork to present a program on railway photography to the Irish Railway Record Society. Honer Travers and I spent an afternoon in Glounthaune where I made these photos on Kodak Tri-X using my Nikon N90S with f2.0 35mm lens. My film processing was very traditional: Kodak D76 (mixed 1 to 1) for 7 minutes 15 seconds at 68F. I agitate very gently to minimize the effect of grain. Routine operations, such as Irish Rail’s Cork suburban trains, offer great opportunity for creative railway photography. In both of these images, I’ve worked with foreground, middle-ground and background by using shallow depth of field to create a sense of depth. An Irish Rail 2600-series railcar works toward Glounthaune from Kent Station, Cork. 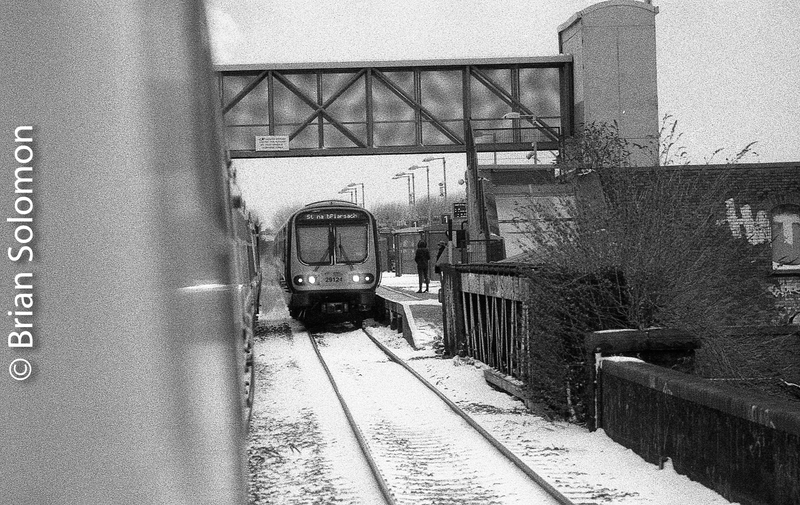 A Cork-bound railcar accelerates away from its station stop at Glounthaune. Unexpected Results: My Third Experiment with Retropan. It was a misty January day. 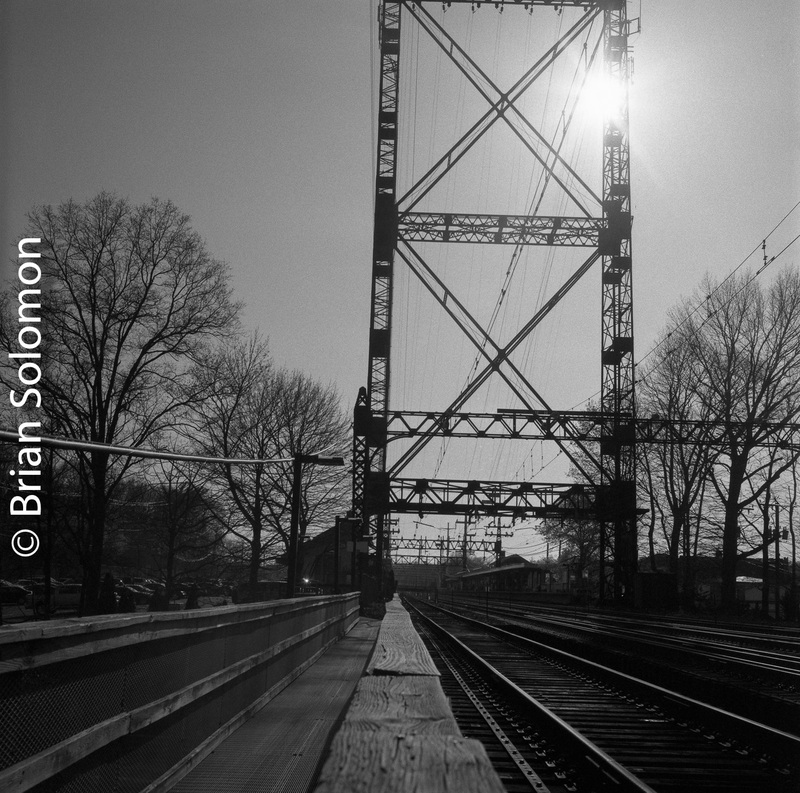 I thought, what better time to expose another roll of Foma Retropan 320 black & white film! I was working with four cameras that day, so these images were just a small portion of my day’s results, but for me by far the most interesting. 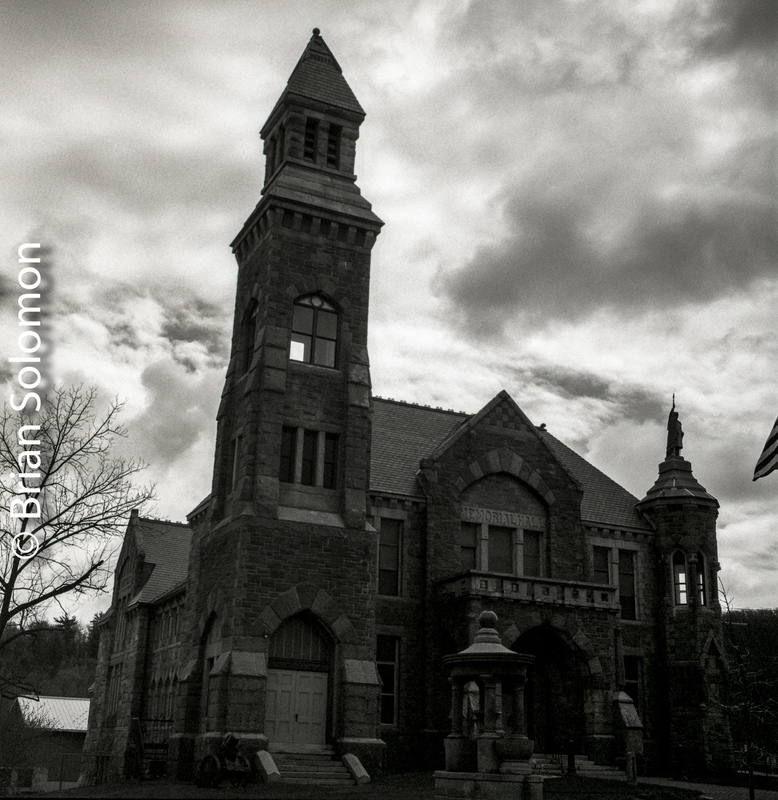 I was feeling nostalgic and the atmosphere of the moment seemed to lend itself to classic black & white. The day after I exposed my film, I processed it. Where previously, I’d hand processed Retropan in Paterson tanks, for this roll I used the Jobo (a semi-automatic processing machine). The Jobo eases processing by keeping all chemistry at a consistent temperature, taking care of agitation by continuously rotating the processing-drum, while simplifying pouring the chemicals in and out of the drum. Also, it makes more efficient use of the chemistry. With the hand-processed rolls, I had used Retro Special Developer straight (undiluted stock solution) with a 3 minutes 30 second development time. Prior to introducing the primary developer, I pre-soaked in a water bath with a drop of HC110. For the Jobo-processed roll, I diluted Retro Special Developer 1:1 with water and increased the time to 4 minutes. I also had a pre-bath with a drop of HC110, but like the main developer, this was agitated continuously. My results were not as I expected. Misty tracks on the old Rutland near Arlington, Vermont. Exposed on Retropan 320 using a Nikon F3 with f1.8 105mm lens. 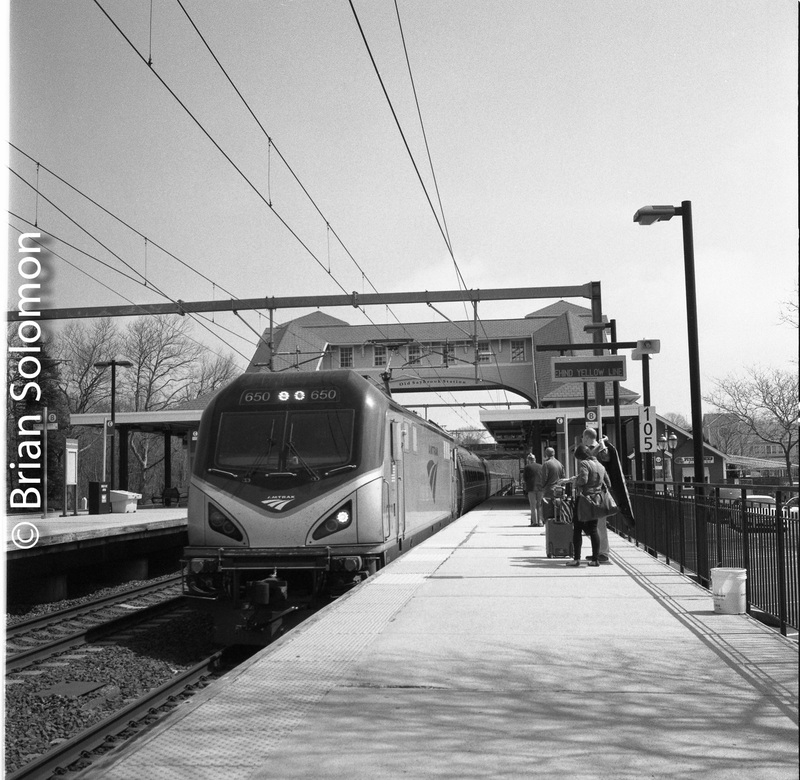 My earlier experiments with Retropan demonstrated a fine grain film with broad tonality. But this roll had much coarser grain, and yet even smoother tones. At first, I was shocked by the more intensive grain, but in retrospect I’ve decided it adds a quality to the photos that I may not have obtained through other media. Exposed on Retropan 320 using a Nikon F3 with f1.4 50mm lens. For my next experiments, I’ll return to hand-processing and I may skip the presoak bath with HC110. 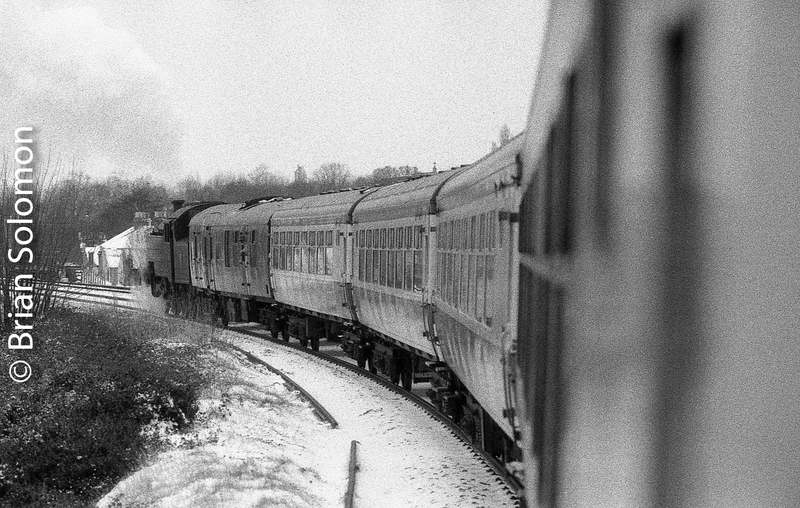 Retropan on the Rails; Experiments with My second Roll of Foma’s 320 ISO Black & White film. 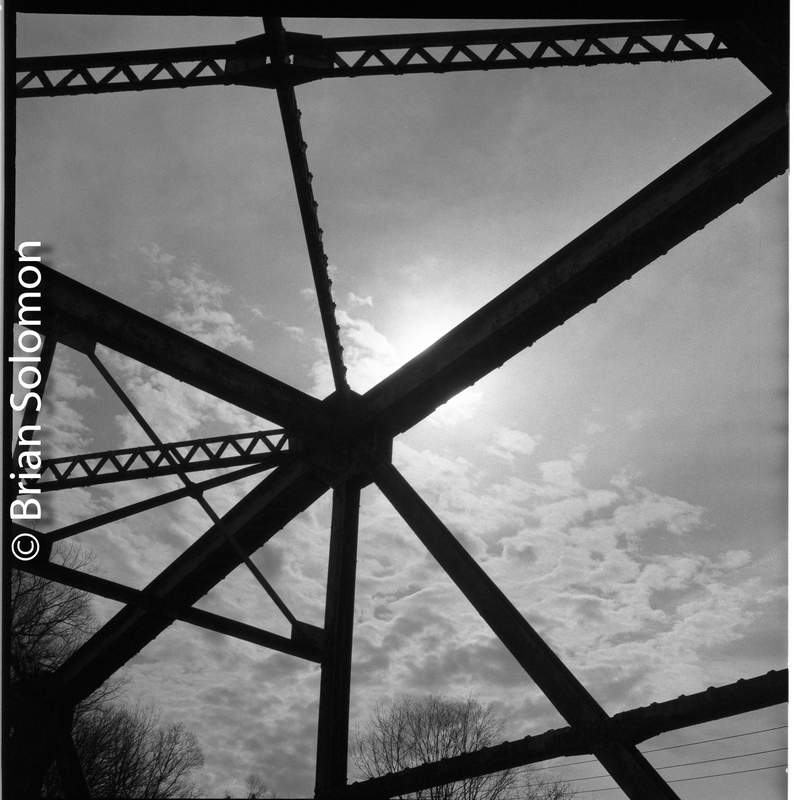 This is a follow up to my Tracking the Light post of January 11, 2017, which displayed the results of my first roll of Foma Retropan. 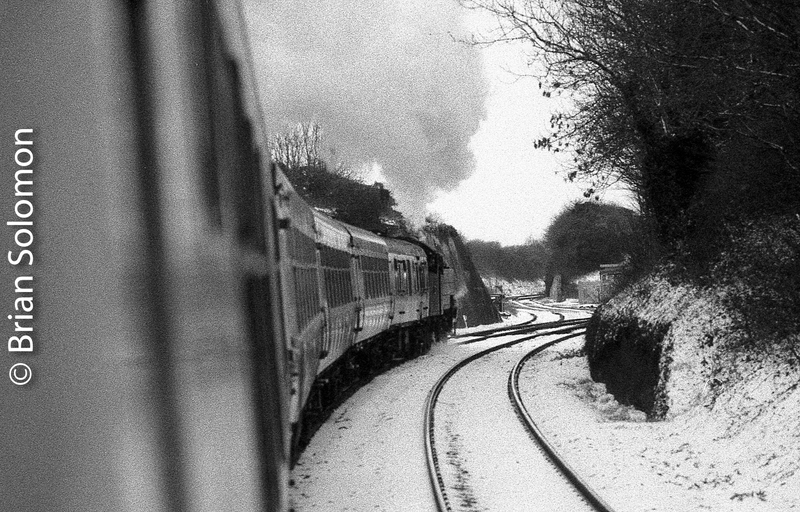 For my second roll, I focused on a variety of railway subjects, aiming to see how this film would perform. This one was exposed using a Nikon F3 with various Nikkor lenses, exposure calculated manually with the aid of a handheld light meter. I made these images in parallel with digital images exposed with my other cameras. As with the first roll, I exposed the Retropan at ISO 320 and processed it more or less as recommended by Foma. 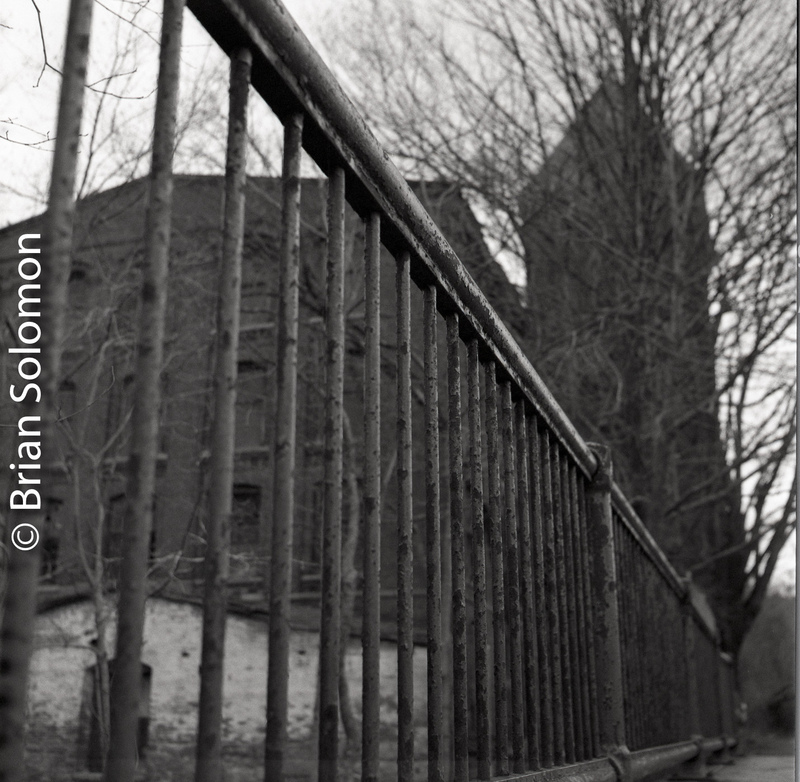 A view of Girard and Broad in Philadelphia, exposed using a Nikon F3 with 24mm f2.8 wide-angle lens. A retro streetcar as seen exposed on Retropan 320. Philadelphia’s Route 15 PCC glides along Girard Avenue. Exposed using a Nikon F3 with 24mm f2.8 wide-angle lens. 1/60th of a second. Another view of a SEPTA PCC car on Girard Avenue, Philadelphia. Exposed using a Nikon F3 with 24mm f2.8 wide-angle lens. A SEPTA Silverliner IV approaches Cornwells Heights, Pennsylvania on the former Pennsylvania Railroad. Exposed using a Nikon F3 with 24mm f2.8 wide-angle lens. Hard glint at New Brunswick, New Jersey. 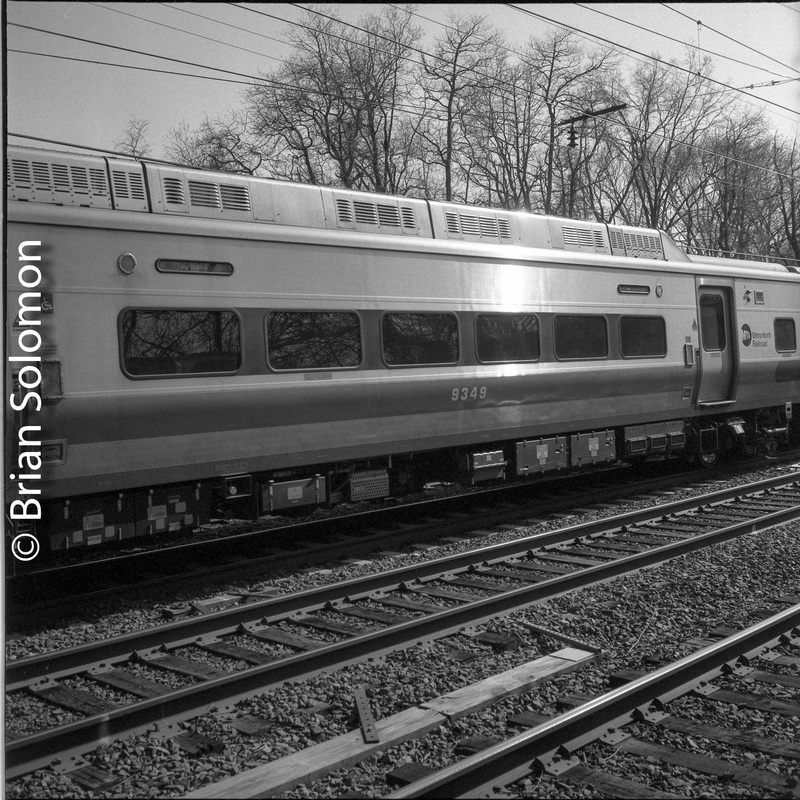 A Washington DC-bound Acela train zips along at speed. Notice how the film reacts to the tremendous contrast between highlights and shadows. Exposed using a Nikon F3 with 135mm f2.8 telephoto lens. Exposed using a Nikon F3 with 135mm f2.8 telephoto lens. Again, for this roll I used the Retro Special Developer with shortened the processing time (I opted for 3 minutes 30 seconds plus a pre-soaked in a water bath with a drop of HC110. Overall, I was pleased with the tonality and tight grain structure. 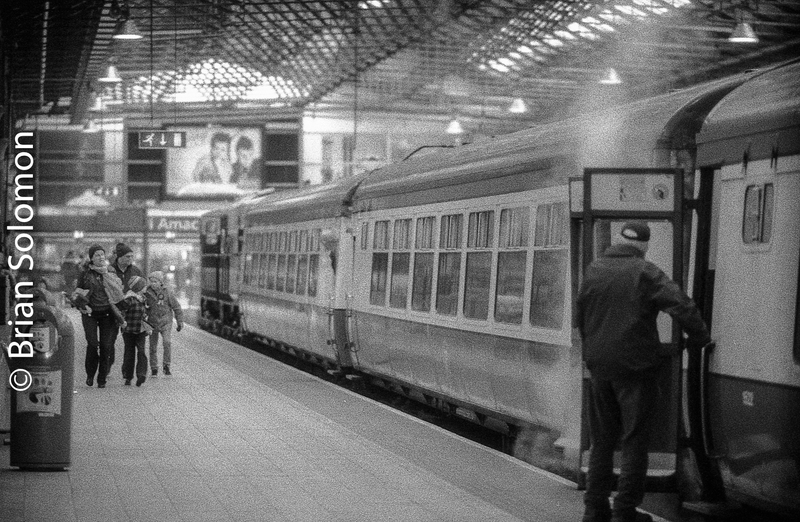 The film has a softer look than other fast black & white films, such as Ilford’s HP5, and a broad tonal range that holds highlight and shadow detail very well. 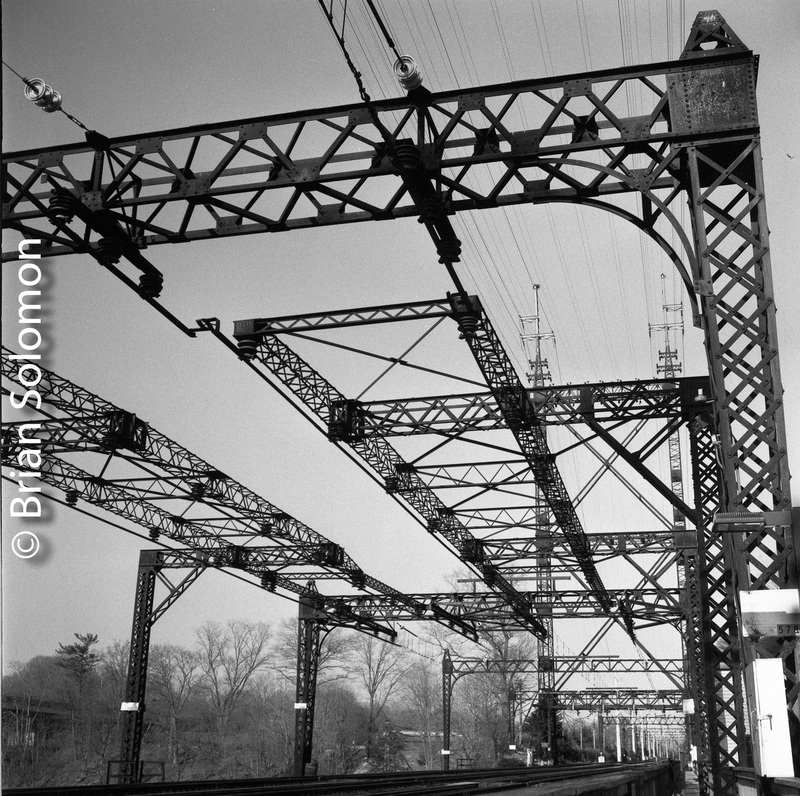 I scanned the negatives with an Epson V750 Pro flatbed scanner. These images are essentially unmodified scans, except for necessary scale reduction for internet presentation plus addition of my watermark. I did not alter contrast, exposure, tonality, or perform sharpening. This test went so well, for my next experiment, I decided to significantly alter my processing of the film. Stay tuned for my bold experiment with Retropan Roll 3! (Sometimes changes produce unexpected consequences). 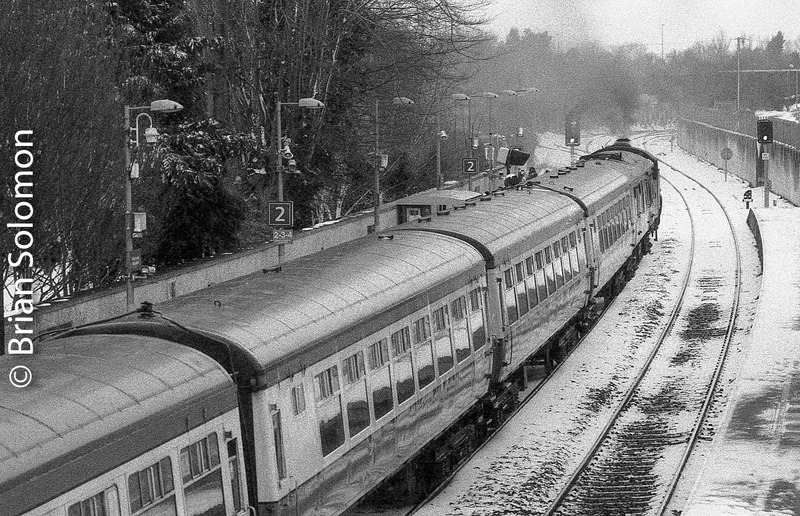 Czech film manufacturer Foma introduced a new black & white film in 2015 called Retropan Soft (ISO 320). This is advertised as a panchromatic, special negative film with ‘fine grain, good resolution and contour sharpness’. Among its features are a ‘wide range of half tones and a wide exposure latitude. I tried my first roll in early December 2016. I have to admit that I was curious, but skeptical. Could this new b&w film change the way I approach film photography? Might it offer something decidedly different than Kodak Tri-X or Ilford HP5? Working with an old Nikon F3 and 50mm lens I wandered around Philadelphia with my brother and exposed a variety of gritty urban images that I thought might benefit from the look advertised by ‘Retropan’. Foma recommended using their specially formulated Retro Special Developer, so I ordered some from Freestyle Photographic Supplies . I shortened the processing time (as I generally find that manufacturer recommended times are too long and lead to excessively dense negatives); plus I pre-soaked the film in a water bath with a drop of HC110 (as described in previous posts). The negatives scanned well, and I was impressed with the tonality of the photographs. I’ve included a selection below. Please note, that although I scaled the files and inserted a watermark, I have not cropped them or manipulated contrast, exposure or sharpness. These photos are essentially un-interpreted. Philadelphia exposed on Foma Retropan Soft and processed in Foma Retro Special Developer. Philadelphia City Hall. Philadelphia exposed on Foma Retropan Soft and processed in Foma Retro Special Developer. Evening view from the same street corner as the daylight photo. Low angle view of an alley. Stay tuned for my next Retropan test! Brian Solomon presents something new on Tracking the Light every day. Railway Preservation Society Ireland: 071 Connolly Station, 21 April 2014. On the day, steam locomotive 461 had done the honors for the paying passengers. 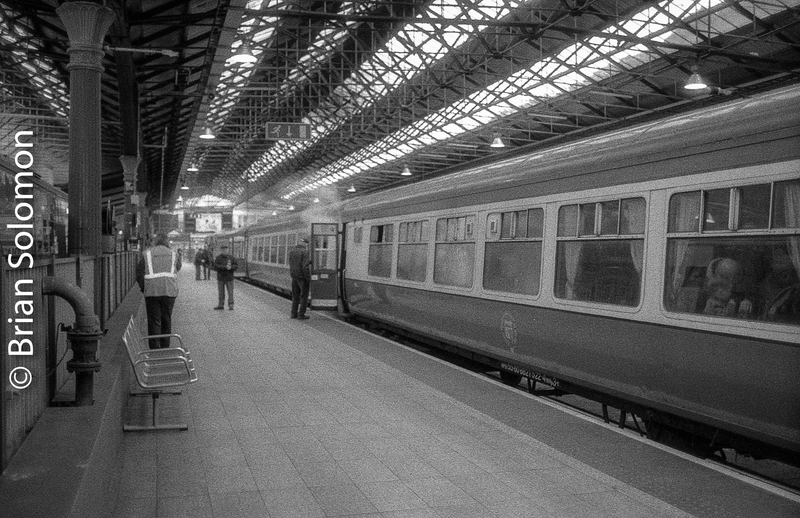 After the train arrived back at Connolly, freshly painted Irish Rail 071 (class leader) tied onto the empty carriages to bring them across to Inchicore. Irish Rail class 071 at Connolly Station with the RPSI empty Cravens on 21 April 2014. Exposed on Fuji Acros 100 film. I exposed this view at the end of the day using my Nikon F3 with 24mm lens. Using my perfected chemical recipe, I processed the Fuji Acros 100 film in Kodak HC110 then toned the negatives with selenium solution. Finally, I scanned them and made minor adjustments in Lightroom (mostly to remove dust spots). Why black & white? Why film? I’ve always exposed film, and while digital photography tends to dominate my image making, I still expose the occasional roll of B&W or color slide film.